Transhumanism (abbreviated as H+ or h+) is an international cultural and intellectual movement with an eventual goal of fundamentally transforming the human condition by developing and making widely available technologies to greatly enhance human intellectual, physical, and psychological capacities. Transhumanist thinkers[who?] study the potential benefits and dangers of emerging technologies that could overcome fundamental human limitations, as well as the ethics of developing and using such technologies. The most common thesis put forward is that human beings may eventually be able to transform themselves into beings with such greatly expanded abilities as to merit the label “posthuman“. Some critics of libertarian transhumanism have focused on its likely socioeconomic consequences in societies in which divisions between rich and poor are on the rise. Bill McKibben, for example, suggests that emerging human enhancement technologies would be disproportionately available to those with greater financial resources, thereby exacerbating the gap between rich and poor and creating a “genetic divide”. Lee Silver, a biologist and writer on the genetic future who coined the term “reprogenetics” and supports its applications, has nonetheless expressed concern that these methods could create a two-tiered society of genetically-engineered “haves” and “have nots” if social democratic reforms lag behind implementation of enhancement technologies. Critics who make these arguments do not thereby necessarily accept the transhumanist assumption that human enhancement is a positive value; in their view, however, because it could confer additional power to the already powerful it should be discouraged or even banned. Some critics also question the social implications of the movement’s focus on body modification. Political scientist Klaus-Gerd Giesen, for example, has asserted that transhumanism’s concentration on altering the human body represents the ultimate form of consumerism and is thus a negative manifestation of advanced capitalism. The 1997 film Gattaca’s depiction of a dystopian society in which one’s social class depends entirely on genetic modifications is often cited by critics in support of a combination of these views. Most of these criticisms are taken seriously by many transhumanist advocates, especially self-described democratic transhumanists, who believe that the majority of current and future social problems (such as unemployment or resource depletion) need to be addressed by a combination of political and technological solutions (such as a guaranteed minimum income or alternative technology). Therefore, on the specific issue of an emerging genetic divide due to body modification, bio ethicist James Hughes, in his 2004 book Citizen Cyborg: Why Democratic Societies Must Respond to the Redesigned Human of the Future, argues that techno-progressives must articulate and implement public policies (such as a universal health care voucher system that covers human enhancement technologies) in order to attenuate and even eliminate this problem, rather than trying to ban human enhancement technologies. The latter, he argues, might actually worsen the problem by making these technologies available only to the wealthy on the local black market or overseas in countries where such a ban is not enforced. Bill Joy, co-founder of Sun Microsystems, struck by a passage from Unabomber Theodore Kaczynski’s anarcho-primitivist manifesto quoted in Ray Kurzweil’s The Age of Spiritual Machines, became a notable critic of emerging technologies. Joy’s essay Why the future doesn’t need us argues that human beings would likely guarantee their own extinction by developing the technologies favored by transhumanists. He invokes, for example, the “grey goo scenario” where out-of-control self-replicating nanorobots could consume entire ecosystems, resulting in global ecophage. Related notions are also voiced by self-described neo-luddite Kalle Lasn, a culture jammer who wrote a spoof of the Cyborg Manifesto as a critique of techno-utopianism, who claims that humanity has an inherent lack of competence to direct its own evolution and should therefore completely relinquish technology development. British Astronomer Royal Martin Rees argues, in his book Our Final Hour, that advanced science and technology bring as much risk of disaster as opportunity for progress. However, Rees does not advocate a halt to scientific activity; he calls for tighter security and perhaps an end to traditional scientific openness. Advocates of the precautionary principle, such as the Green movement, also favor slow, careful progress or a halt in potentially dangerous areas. Some precautionists believe that artificial intelligence and robotics present possibilities of alternative forms of cognition that may threaten human life. The Terminator series’ apocalyptic depiction of the emergence of Skynet, a malign computer network which initiates a nuclear war in order to kill as many humans as possible, has been cited by some in this regard. Transhumanists do not necessarily rule out specific restrictions on emerging technologies so as to lessen the prospect of existential risk. Generally, however, they counter that proposals based on the precautionary principle are often unrealistic and sometimes even counter-productive. In his television series Connections, science historian James Burke dissects several views on technological advance, including precautionism and the restriction of open inquiry. Burke questions the practicality of some of these views, but concludes that maintaining the status quo of inquiry and development poses hazards of its own, such as a disorienting rate of change and the depletion of our planet’s resources. The common transhumanist position is that society should take deliberate action to ensure the early, yet safe, arrival of the benefits of emerging technologies rather than fostering what it considers to be anti-scientific views and technophobia. One transhumanist solution proposed by Nick Bostrom is differential technological development, in which attempts would be made to influence the sequence in which technologies developed. In this approach, planners would strive to retard the development of possibly harmful technologies and their applications, while accelerating the development of likely beneficial technologies, especially those that offer protection against the harmful effects of others. “Eugenics is the self-direction of human evolution”: Logo from the Second International Congress of Eugenics, 1921, depicting it as a tree which unites a variety of different fields. A trenchant argument against transhumanism comes from critics who allege social bias in the use of concepts such as “limitations”, “enhancement”, and “improvement.” Such critics see the coercive eugenics, social Darwinist and master race ideologies and programs of the past as warnings of what the promotion of eugenic enhancement technologies might unintentionally encourage. While some acknowledge the differences between coercive and elective forms of eugenics, they argue that the social stratification that may result from the latter would still be problematic. In particular, in their view, it could present unprecedented challenges to democratic governance, even if it came about as the cumulative result of individual choices. Some fear future “Eugenics Wars”, a speculative form of genetic class warfare, as the worst-case scenario. Health law professor George Annas and technology law professor Lori Andrews are prominent advocates of the position that the use of these technologies could lead to human-posthuman conflict and new forms of genocide. For most of its history, eugenics has manifested itself as a movement to sterilize against their will the “genetically unfit” and encourage the selective breeding of the genetically advantaged. The major transhumanist organizations strongly condemn the coercion involved in such policies and reject the racialist and classist assumptions on which they were based, along with the pseudoscientific notions that eugenic improvements could be accomplished in a practically meaningful time frame through selective human breeding. Most transhumanist thinkers instead advocate a form of egalitarian liberal eugenics. In their 2000 book From Chance to Choice: Genetics and Justice, bioethicists Allen Buchanan, Dan Brock, Norman Daniels and Daniel Wikler have argued that liberal societies have an obligation to encourage as wide an adoption of eugenic enhancement technologies as possible (so long as such policies do not infringe on individuals’ reproductive rights or exert undue pressures on prospective parents to use these technologies) in order to maximize public health and minimize the inequalities that may result from both natural genetic endowments and unequal access to genetic enhancements. Transhumanists holding similar views nonetheless distance themselves from the term “eugenics” (preferring “reprogenetics”) to avoid having their position confused with the discredited theories and practices of early-20th-century eugenic movements. An artist’s concept of what a human-dog hybrid might look like. The provocative creatures are part of a sculpture by Australian artist Patricia Piccinini entitled “The Young Family,” produced to spark reflection on the alleged perils of creating human-animal mixtures.Acknowledging the power of biotechnology to make profound changes in organismal identity, bioconservative activist Jeremy Rifkin and biologist Stuart Newman argue against the genetic engineering of human beings because they fear the blurring of the boundary between human and artifact. Philosopher Keekok Lee sees such developments as part of an accelerating trend in modernization in which technology has been used to transform the “natural” into the “artifactual”. In the extreme, this could lead to the manufacturing and enslavement of “monsters” such as human clones, human-animal chimeras, or even replicants, but even lesser dislocations of humans and nonhumans from social and ecological systems are seen as problematic. The film Blade Runner (1982), the novels The Boys From Brazil (1978) and The Island of Dr. Moreau (1896) depict elements of such scenarios, but Mary Shelley’s 1818 novel Frankenstein is most often alluded to by critics who suggest that biotechnologies (which currently include cloning, chimerism and genetic engineering) could create objectified and socially-unmoored people and subhumans. Such critics propose that strict measures be implemented to prevent these potentially dehumanizing possibilities from ever happening, usually in the form of an international ban on human genetic engineering. Objecting to what science writer Isaac Asimov termed the “Frankenstein complex”, transhumanists and non-anthropocentric personhood theorists argue that if they are self-aware, human clones, human-animal chimeras and uplifted animals would still be unique persons deserving of respect, dignity, rights and citizenship. They conclude that the coming ethical issue which must be dealt with is not the creation of monsters but what they view as the “yuck factor” and “human-racism” that would judge and treat these creations as monsters. Really good! If only the people who wrote it dated it and put their name! Augment is a term used to describe a group of genetically engineered Humanscreated by advances in DNA resequencing in the mid 20th century. In the 22nd century, Klingons created their own Augments using the original augmented Human DNA. 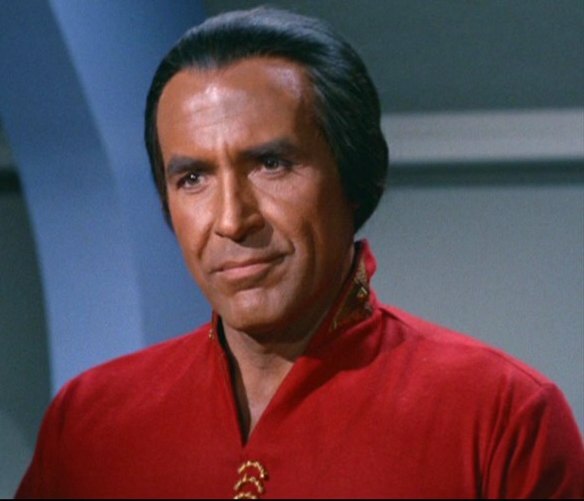 Khan Noonien Singh in 2285, the Augment tyrant and last vestige of the Eugenics Wars. According to the novelization of Star Trek Into Darkness, after Kirk had died, Dr. McCoy was unsure whether any of the other Augments had the same genetic traits as Khan and they didn’t have enough time to find out. For this reason they wanted Khan’s blood to save Kirk. Dr. Stavos Keniclius, a genetic engineer involved in the Eugenics Wars. In Star Trek Into Darkness set in 2259, one of these Augments of the 1990s was said to be 300 years old. This suggests the Augment of the Eugenics Wars were born around the late 1950s. This is also quite close to Khan’s age as it was mentioned in the novel The Rise and Fall of Khan Noonien Singh, Volume 1, which gave his birth year as 1970. In the 2130s, Arik Soong, senior medical director of Cold Station 12, managed to steal several Augment embryos from the facility, which he took to the Trialas system, where he raised the resulting children as his own. A decade later he was captured by Earth forces, but refused to disclose what had happened to the embryos. (ENT: “Cold Station 12“)In May 2154 the answer to this puzzle was discovered when Soong’s Augments, led by Malik, seized control of a Klingon Bird-of-Prey, jettisoning its crew into space. 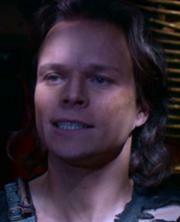 (ENT: “Borderland“) The Klingons recovered these bodies, and discovering the Human DNA on them, threatened war. The NX-01 Enterprisewas launched to the Borderland to find these Augments and bring them back to Earth, and Arik Soong was recruited to assist the ship in doing so. A Klingon prisoner infected with the Augment virus. After the Augment crisis, the Klingons attempted to create their own augments to combat the Humans, believing that Humans would place Augments on their ships and put the Klingons at a severe disadvantage, despite Vulcan’s assurance that Earth had banned such genetic enhancement decades ago. They were able to retrieve multiple embryos left over in the debris of the Augment Bird-of-Prey and implemented their DNA in certain Klingons. 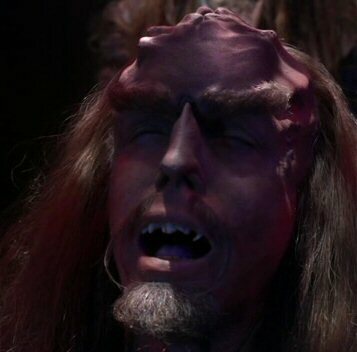 However, due to the aggressiveness of Augment DNA, the cranial ridges started to dissolve and the Klingon Augments completely lacked ridges on their foreheads.These subjects did gain increased strength and intelligence, but they died when their neural pathways degraded. Unfortunately, one of the subjects was suffering from Levodian flu, which was modified by the Augment genes to become a deadly, airborne plague that spread throughout the Empire. An early symptom of this plague caused victims to lose the ridges on their foreheads and to look more Human. Other symptoms included irregular heartbeat, chest pain, and tingling in the cranial ridges. The Klingon Augment situation was used to explain why Klingons in Star Trek: The Original Series had flat foreheads, showed fear more openly, and had straight teeth. The fate of Khan and his Augments remained unknown until 2267, when theUSS Enterprise discovered the SS Botany Bay, a DY-100 class sleeper ship. Aboard the ship was Khan and 72 of his fellow Augments (twelve had died due to stasis unit failure in the interim). At first the Enterprise crew was unaware of the true identity of Khan, but when it was discovered, Khan attempted to take the ship, though he ultimately failed.Enterprise commanding officer James T. Kirk generously offered Khan and his followers voluntary exile to the uninhabited Class M planet Ceti Alpha V, and Khan accepted. (TOS: “Space Seed“) Unfortunately, six months later the nearby planet Ceti Alpha VI exploded, causing the orbit of Ceti Alpha V to shift, which devastated the planet’s environment. The dominant remaininglifeform was the Ceti eel, which claimed many of Khan’s followers.